"State Anthem of the Russian Federation"
The Crimean Peninsula is recognized as territory of یوکرین by most of the international community, but is de facto administered by Russia. ↑ 862 marks the "arrival of Rurik", considered a foundation event by the Russian authorities (Указ Президента РФ "О праздновании 1150-летия зарождения российской государственности" (روسی زبان میں)); 882 marks the accession of Oleg of Novgorod. 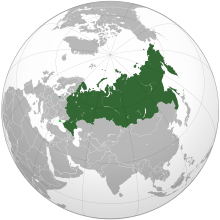 ↑ When including the جمہوریہ کریمیا and سواستوپول, the total population of Russia rises to 146,519,759. ↑ (روسی زبان میں) Official estimate as of 1 September 2012.